The fact that there are apparently errors in SO MANY opcodes leads me to believe that the bug has something to do with a common piece of code used by some or many of them. Perhaps something like decoding register fields or the like. Although, I've already tried to find issues there, and I'm not able to see one. Either that, or it's a problem in an opcode that the test software uses to calculate the CRC of the results. Unfortunately, I can't find the source code to this test software. Or maybe it's an issue with flag calculation(s)?? Could be so many things, that's the hard part about writing CPU emulators, the debugging! 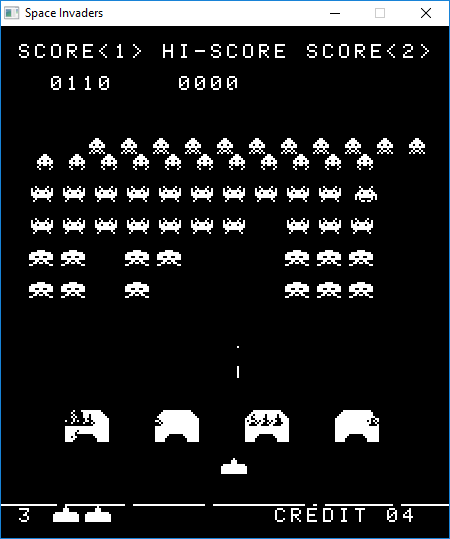 It DOES run Space Invaders, but there is a bug there where rows of enemies don't get cleared from the screen at the top as they move down the play field as you can see below. Maybe this will help someone. Thanks for any help you guys can provide. Last edited by miker00lz; April 9th, 2018 at 03:39. Reason: Forgot to link source code. This may not be related to your bugs in either Space Invaders or 8080 Instruction Exerciser. Briefly looking at your source, I can see that your implementation of the HLT op-code is unreachable. Because of the order of if statements here, the former code is unreachable. i.e., if your opcode variable is 0x76, the condition ((opcode & 0xC0) == 0x40) was already satisfied first, incorrectly interpreting the operation as a MOV instead of a HLT. By using either an array of pointers to functions or a switch statement, you'll save a fair deal of overhead with program size as well as performance. You'll also render the outcome of duplicate or mis-ordered (because there is no dynamic ordering) op-code implementations an impossibility. Things will be smaller, faster, and static. I did not finish analyzing the entire function to see if HLT was the only bugged op-code affected by this design problem. To avoid distractions caused by design issues like these while hunting for bugs that may (or may not) turn out to be entirely unrelated, I would go with a switch. Good points, and I did know the performance would be worse. My previous emulators (8086 and 6502) have all used a switch block or a function pointer array. I just changed this one to a switch block. Turns out the only conflict with the masking was with MOV and HLT at instruction 76h which you pointed out. Unfortunately, this did not fix any CPU bugs other than HLT not being usable, which I expected after I saw that was the only opcode conflict. I'll just have to keep combing through the code and comparing with the documentation. Possibly a flags issue. Getting the flags right was hell on the 8086 emu, but the 8080 seems simpler in that regard. I've gotten a lot closer. I was already forcing bit 1 of the flags register to appear set, but neglected to mask out bits 3 and 5. I think the instruction exerciser POPs the flags and inserts them into the calculation for the CRC, so this could have caused issues if the program manually set the PSW somewhere with bits 3 and/or 5 set. Now it seems to just mainly be something going awry in the 8-bit ALU operations. This narrows my debugging scope by quite a bit! I have a fully functional space invaders emulator but my 8080 core struggled to pass those tests. Your post was inspirational and i really apreciate your comment. Cant belive i didnt think to mask out the not used bits on the F register. So i masked 0xD7 and | 0x02 on F and it just passed a bunch like you. Thanks for the comment and i hope you got your space invaders emu working!!! I struggled 3 weeks to finish it and was a very enjoying experience. Now... Do you pass other tests? have you tried cputest.com cpudiag.com test.com ? Maybe is a timing thing? Wish you look if you have not finished it yet! Last edited by Bluestorm; October 28th, 2018 at 20:12.